← Grace – What Is So Amazing About It? On a clear day, you can see forever. Well maybe not forever, but you can see a long way. That is why I love the mountains. “The view just takes your breath away.” That is what my blogger friend Robyn over at Robyn’s Patch said in a comment she left on my Day Tripping In The Mountains post the other day. As we drove the 30 miles of the Northern segment of Sky Line Drive, we encountered 17 overlooks that gave us a chance to pull over and take in the scenery. Here are a few of my favorite views. And as a special treat, I include these photos of the Meams Bottom Covered Bridge. 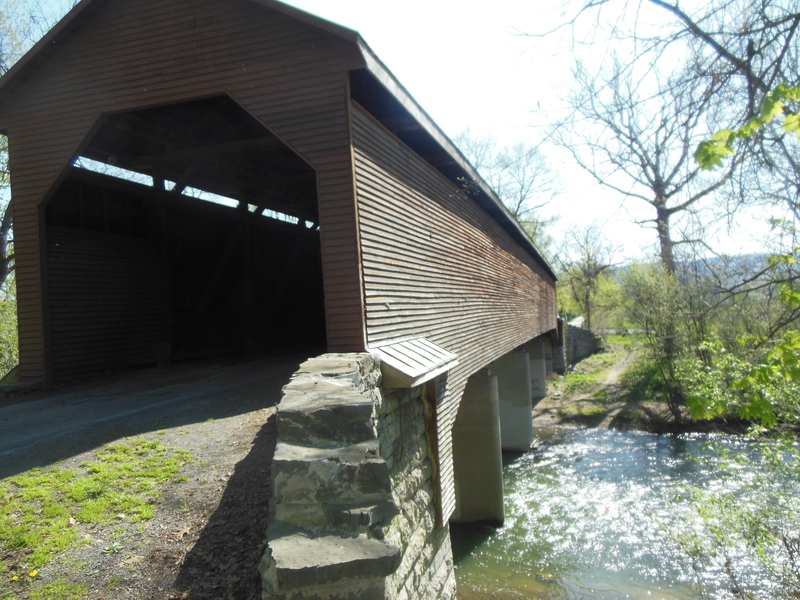 Located on VA-720, a couple of miles West of US-11, near New Market, VA, this bridge is one of 8 covered bridges in Virginia and the only one on public land. 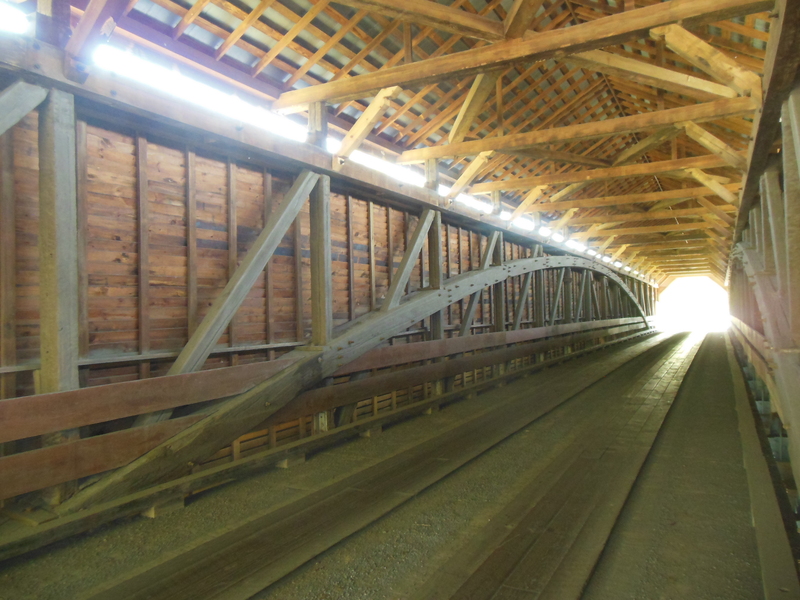 Constructed in 1894, it spans 204 feet as it crosses the North Fork of the Shenandoah River. It was damaged by vandals in 1976 and reopened in 1979 after it was strengthened by adding concrete pilings and steel beams so it could safely carry heavier vehicles. The bridge was constructed using the Burr Truss design, which was patented by Theodore Burr, the brother of US Vice President Aaron Burr in 1817. It was placed on the National Register of Historic Places in 1975. This is the second historic covered bridge we’ve visited. The first was the Union Covered Bridge we visited in 2013 while we were in Paris, Missouri. It is so cool to see historic places like this. Tomorrow I will tell you about some of the projects I’ve been working on here at Harrisonburg/Shenandoah KOA RV Park. This entry was posted in Virginia and tagged Covered Bridge, Shenandoah River, Sky Line Drive. Bookmark the permalink. I’ve always been intrigued with the idea of the covered bridges Jerry – what was the origin/reason for having a cover over the bridges ? Oh I love covered bridges. In Ohio in Ashtabula County there are many! I have been to all of them. They just intrigue me. The scenic views were fabulous! I do agree with your friend… You can see for miles and miles! I love the design of covered bridges. They show engineering marvels. The mountains in the Eastern US are not as majestic as they are in the Western US, yet they are still beautiful. One day we will get to your neighborhood out west and visit some of the cool spots out there. I’m glad you had a chance to connect with Ingrid.